When I was teaching high school, I taught the book They Poured Fire on Us From the Sky. This was my first real introduction to the Lost Boys and the war in Sudan. I’d heard mention of it on the news and in conversation, but had no real personal connection. You see, I live half-way around the world, and at the time it had no real significance to my day-to-day life. But this is the beauty of what books can do. When I read They Poured Fire… I was given a personal, first-hand account of the absolute horrors of the war that occurred and the devastation of the people (mostly young boys) who were left behind. The book gave me insight, connection, and a desire to help, to know more, and to be more aware…more prayerful…for the people suffering every day in other parts of the world. Books can make that happen, they connect history and news to our hearts and help us see the pain and suffering of others. Since teaching They Poured Fire…, I have been able to meet a few of the Lost Boys since they have a center here in Arizona. I’ve also read articles and done fundraisers here and there to help them out in small ways, but since I’ve been home taking care of kids recently, my ability to help much outside is a little more limited. Then the book A Long Walk to Water was recommended and the reminders, desire to help, and the desire to teach others about the atrocities in other countries has been renewed. A Long Walk to Water is told in two narratives. 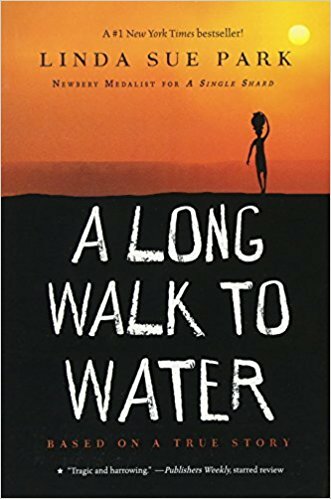 The true story of Salva, a young boy who became a Lost Boy when his town was destroyed during the war in Sudan, and Nya, a fictional character who, in a more resent past, must walk to get water for her family every day. Both characters suffer and long for water on their long walks each day. Salva’s story is a sad and tragic one. He witnesses countless horrors of war like being forced out into the middle of the desert in Africa with nothing, and the inhumanity of other people. It is a hard story to read, but one that ends happily. Nya’s story is a familiar one to many in Africa who can’t find clean water and who suffer physically for it. This story is written for a younger audience that the first novel I mentioned and is a great introduction to the things that have happened (and are still happening) in Africa. 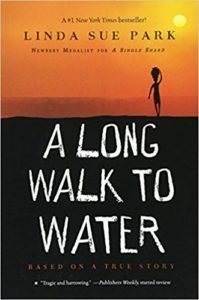 The first novel I mentioned is much more graphic and difficult to read, and A Long Walk to Water would be great for a young reader to read with parents or a class. I loved A Long Walk to Water. I can only imagine the impact it would have on a young adult and the amazing ways they might choose to respond to what they will learn. All of this injustice can mean so much more to them when they find a connection to the young children in the books and they realize there is something they can do to help. Imagine the possibilities! Salva’s friend is eaten by a lion. Salva’s uncle is shot while tied to a tree. How does the prospect of having a water accessible to Nya’s village change her future? How can prayer help people we don’t even know? What are some ways we can pray for people in war-torn countries? How do we see examples of perseverance in the story? How does Salva’s suffering give him the desire to help others? How does Salva’s American family give him a second chance by opening their home to him? You can use some of these resources from Prestwick House. Use this guide from Teachersguide to get some great extension activities. Watch the movie God Grew Tired of Us which is about the Lost Boys of Sudan. The documentary follows some of the boys from the refugee camp on their way to America and the culture shock they experience when they arrive. If you’d like a lesson plan with extension activities, National Geographic has some great extensions and lesson plans you can find here. For fundraising ideas and for videos about Salva and his journey, you can find a plethora information at the Water for South Sudan page here. Find out what makes a “just war” from the Catholic perspective here. Read about Catholic social teaching about refugees and the migration of people here. Say the Prayer for Refugees and Victims of War found here. Set aside time to pray with your family for victims of war and those who have been displaced every week (or more!). Learn more about Saint Josephine Bakhita, the patron saint of Sudan here.